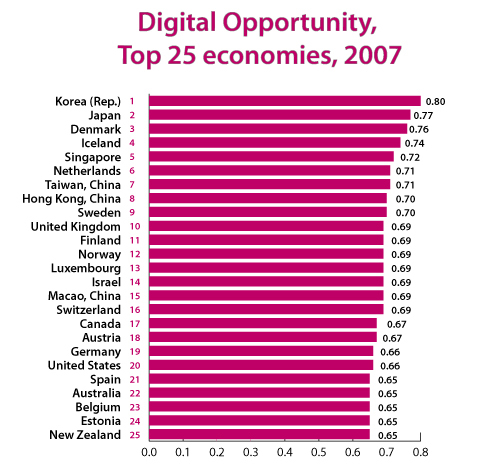 What is the Digital Opportunity Index (DOI)? The Digital Opportunity Index is an e-index based on internationally-agreed ICT indicators. This makes it a valuable tool for benchmarking the most important indicators for measuring the Information Society. The DOI is a standard tool that governments, operators, development agencies, researchers and others can use to measure the digital divide and compare ICT performance within and across countries. The Digital Opportunity Index (DOI) is based on 11 ICT indicators, grouped in 3 clusters: opportunity, infrastructure and utilization. The DOI has been compiled for 181 economies for a period of three years from 2004-2006. An even longer time series for 62 leading economies for the period 2000-2006 is also available. Note: The index ranges between 1 and 0, where 1 would be complete digital opportunity. Source: World Information Society Report 2007: Beyond WSIS. A working methodology was developed and presented at the WSIS Thematic Meeting on Multi-Stakeholder Partnerships for Bridging the Digital Divide held in Seoul on 23-24 June 2005. It outlined a methodology for the DOI, and analyzed 2003 data for 40 economies. As a composite index, the DOI allows the tracking and comparison of countries in different aspects of the Information Society. It measures countries’ ICT capabilities in infrastructure, access path and device, affordability and coverage, and quality. The Digital Opportunity Index measures these aspects, including price and affordability of ICTs (Internet and mobile, relative to average income. The Digital Opportunity Index measures the ICT penetration of households and individuals relative to 100% ownership, to measure growth in the ICT development of each economy over time. This enables cross-country comparisons, as well as comparisons of growth in digital opportunity over time. Information and Communication Technologies (ICTs) are fundamentally changing how firms do business and how countries compete in the new ‘information economy’. This shift, and the rapid evolution of these technologies, led to concerns among economists and the international community that developing countries are being left behind in the emerging Information Society – not just in basic infrastructure, but in their abilities to compete in service industries, experience, and skilled labor. At the World Summit on the Information Society (WSIS), a UN Summit organized by the International Telecommunication Union in a unique two-phase format (Geneva 2003, Tunis 2005), governments and world leaders made a strong commitment towards building a people-centered, inclusive and development-oriented Information Society for all, where everyone can access, utilize and share information and knowledge. WSIS has identified the need to measure the advances made in breaching the digital divide and in promoting the broad development goals included in the United Nations Millennium Declaration through increased access and use of ICTs. In the spirit of the Millennium Development Goals, the WSIS implementation seeks to connect villages, schools, hospitals and libraries, and to ensure that over half of the world’s population has access to ICTs by 2015. In order to achieve this, it is essential to identify policies that have successfully promoted access to ICTs, policies that are less effective, and to track progress towards these goals. To this end, the WSIS Plan of Action prioritizes evaluation and tracking of countries’ progress in adopting ICTs by establish a composite “Digital Opportunity Index” to track each country’s evolution towards the Information Society. The Digital Opportunity Index (DOI) was endorsed in the Tunis Agenda for the Information Society, adopted during the Tunis Phase of WSIS. Accordingly to para 117 of the Agenda, which encourages the further development of indicators in a “collaborative, cost-effective and non-duplicative fashion”, the Digital Opportunity Platform mobilized and coordinated efforts for further developing the DOI as a tool for better measurement of the digital divide, as a part of the ongoing work on the WSIS implementation. The Index was developed in close collaboration with the Korea Agency for Digital Opportunity and Promotion (KADO) and the United Nations Conference on Trade and Development (UNCTAD).